The numbers are available here. Business economists have lowered their estimates for economic growth in the second quarter following news of a significant contraction during the first three months of the year. The April to June forecast fell to 3 percent from a 3.5 annual rate in June, according to a special survey released Friday by the National Association for Business Economics (NABE). The forecast change is due mostly to a late June report showing that the economy shrank at a 2.9 percent pace in the first quarter. . . .
“Nobody knows exactly how much taxpayer money is wasted through improper payments, but the federal government’s own astounding estimate is more than half a trillion dollars over the past five years,” said Rep. John Mica, R-Fla. “The fact is, improper payments are staggeringly high in programs designed to help those most in need — children, seniors and low-income families.” . . .
FALLON: "Here is some news out of Washington. House Speaker John Boehner is threatening to sue President Obama for using executive actions to create laws instead of going through Congress first. And Obama just shrugged and made a new law saying you can't sue the president. [Fallon pretending to be Obama] I can do this all day Boehner." 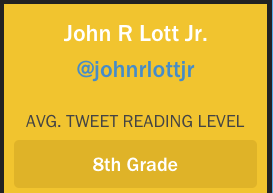 A measure of reading level of tweets is available here. Some amusing comparisons are here. Possibly the level that people write at might be one very rough measure of intelligence. 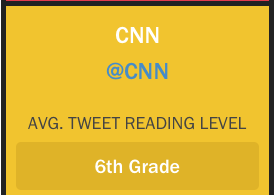 With actor Jim Carrey juvenile humor, it probably isn't too surprising that his tweets are at a 3rd grade level. Or that Kanye West tweets at the 4th grade level. 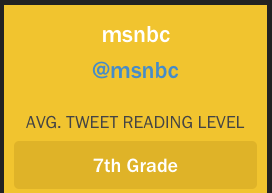 But it is more interesting to compare some political commentators. Ann Coulter is at the 8th grade level of reading, but the Washington Post's Greg Sargent is at 3rd grade. Fox News has a higher level of posts than CNN, CBS, and NBC, but the same as MSNBC. 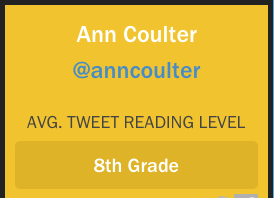 I have looked at a number of columnists at the Washington Post and they are usually at the 7th grade level of reading, again a little below Coulter and the same as Ted Nugent's. 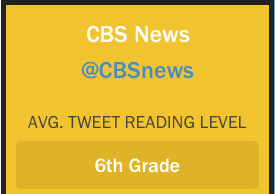 Both also score higher than the WaPo's Greg Sargent, NYT's David Leonhardt, or Justin Wolfers. Of course, at least over some range, some could argue that being able to make more complicated ideas simpler is actually more difficult. 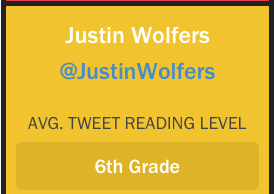 I am not sure if this could explain a 3rd grade level of reading, but I am open to a discussion. Newest Fox News piece: "Mr. Obama, you can’t blame our economic troubles on weather"
The economy took a bad hit during the first quarter this year. It shrunk at an annual rate of 2.96 percent. Since the beginning of 1947, there are only 16 of the 268 quarters experienced worse growth. The Obama administration blames the slow growth on the “historically severe winter weather, which temporarily lowered growth.” Jason Furman, the chair of Obama’s Council of Economic Advisors, made this assertion again on July 3 and President Obama has made this claim several times. But that doesn’t square with the historic data. 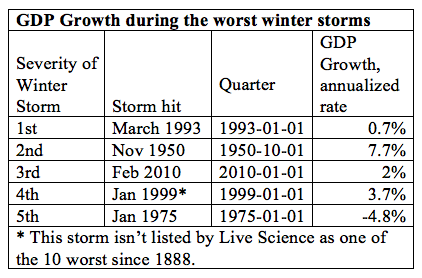 The five worst winter storms or winters with the coldest temperatures do not match economic downturns. In a list of the worst United States winter storms since 1888, Epic Disasters, using National Weather Service data, lists five of the ten worst occurring since 1947. Four of the five saw economic growth. Only during the fifth worst stormdid the economy shrink. The average annualized GDP growth during the quarters when those storms struck was 1.8 percent. . . . . Besides hosting “America's Most Wanted” and advocating for victims’ rights, Walsh has been a longtime advocate of background checks and other safety measures. He said he would continue that fight now that he is joining CNN as the host of “The Hunt,” a new show about catching fugitives. . . .
“I am the guy that has seen both sides of the issue,” Walsh told reporters Monday. “I own guns. I'm the father of a murdered child. I've done nothing but track violence in America since my son was murdered. We have a serious problem with guns in this country. And we refuse to address it. 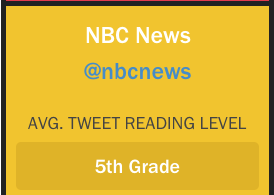 And the NRA solution to arm every grammar-school 80-year-old teacher with a gun is absolutely ludicrous,” he said. Walsh said the NRA is so deeply in the pocket of the gun industry that “they're not a lobbyist on Capitol Hill, they're a gun manufacturer rep.” He also said Vice President Joe Biden recently agreed with him that politicians are “scared s—less” of the NRA. . . .
Just because background checks work well in theory doesn't mean that the current system actually works that way. 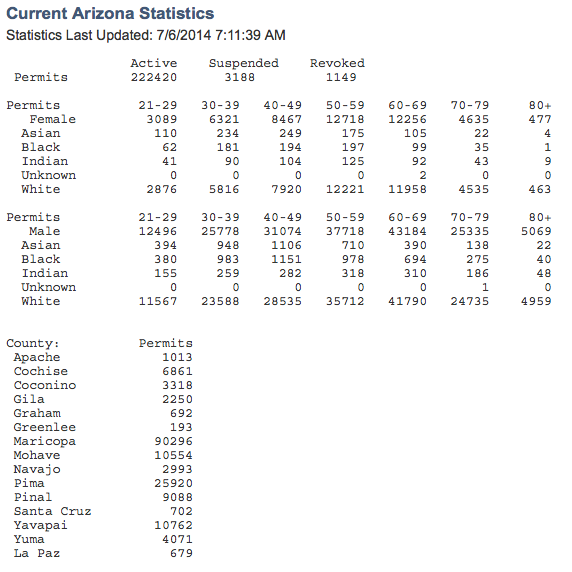 You can find out some of the problems with the background check system here and here. Obviously the claim that the NRA wants to arm everyone in schools is a gross exaggeration. The NRA proposal was to arm uniformed guards, something that Bill Clinton had supported when he was president, and something that I thought was a mistake because armed guards are likely to be the first target. “I said to Joe Biden, '90 percent of Americans are for a responsible background check for a gun, and you know what this Congress has done? Not voted on it, not brought it to the floor, not introduced a bill,'” Walsh said. “I said, ‘They're all scared shitless of the NRA, aren't they?'” . . .
You can find out why his claim is incorrect here. So can the bad winter storms during the first quarter of 2014 explain the shrinking economy? The Obama administration has blamed the slow growth on the “historically severe winter weather, which temporarily lowered growth.” Jason Furman, the chair of Obama’s Council of Economic Advisors, made this assertion again on July 3rd. In a list of the worst United States winter storms since 1888, Epic Disasters, using National Weather Service data, lists five of the ten worst occurring since 1947. Four of the five saw economic growth. Only during the fifth worst storm did the economy shrink. Newest piece at the Philadelphia Inquirer: "Soccer may be 'in,' but it's not an injury-free sport"
With all the recent coverage given to the World Cup, interest in soccer is frequently described as reaching a "tipping point." Even President Obama has done his part to popularize the sport: taking time out from his busy schedule to watch the U.S.-Germany match, playing soccer against a robot on his recent trip to Japan, and chatting with foreign leaders about the game's finer points. But the president appears unaware of the health risks. He has strongly warned Americans about the risks of playing football, going so far this year as saying, "I would not let my son play pro football." He hasn't offered such similar warnings about soccer. Obama is not alone in apparently believing that soccer is less dangerous than American football. Surely the media have been all over how dangerous football is for concussions. And the lawsuits filed by NFL players have received much attention. Unfortunately, soccer is not the benign alternative it is often portrayed as being. In college, women's soccer has a higher rate of concussions than men's football or soccer: 6.3 per 10,000 times women participate in soccer practice or a game versus 4.9 for men's soccer and 6.1 for men's football. Indeed, among college sports, women's soccer has the highest rate of concussions. But concussions aren't the only problem. In total injuries, both men's and women's soccer exceed those of men's football. Total injuries for men's soccer are 11.14 per 10,000 practices or games and 9.7 for women's soccer. For football, the number is 9.5. . . .